Born as blank as canvas in a world brimming with colour and magic, Alice's pale skin and milk white hair mark her as an outcast. Because, for the people of Ferenwood, colour and magic are one and the same. And since the disappearance of her beloved father, Alice is more determined than ever to prove herself and her own magical abilities. To do so she'll have to travel into the mythical, dangerous land of Furthermore, with the help of a fiercely annoying boy named Oliver. But nothing in Furthermore is as it seems, and it will take all of Alice's wits to find her father and return him safely home. The small town of Ferenwood is an eruption of colour, radiant as the magic that consumes the community. Where up is down and night is day, the sun rarely rains and the blossoming flowers are delicious. But for twelve year old Alice Alexis Queensmeadow, her world has been reduced to monochrome. Born without colour, Alice lives within the shadows as a mere servant of her cantankerous mother, yearning for the man who illuminated her life. Since her father mysteriously disappeared several years ago, the Surrender will ensure Alice will be valued as a member of her community and tasked with a immense quest based on her magical abilities. Except Alice wants to dance and dance she will. Oliver Newbanks is a bothersome nuisance and despite her defiance, Alice aches to find her father and accepts Oliver's proposition. Alice and Oliver will need to navigate the rules of Furthermore, an enchanting world in which time is a commodity and children are delectable. Alice is on the verge of a tremendous adventure. To survive Furthermore, find her father and paint her own canvas. Alice is magnificent, unique and incredibly lovely. The reader is introduced to Alice on the eve of her twelfth birthday, a day that poses great significance in the small town of Ferenwood, a community flushed with colour and magic. With her bangle adorned limbs and ravenous taste for eating blooms, Alice is a monochrome canvas which ensures her unseemly status as a pariah. At the tender age of nine years old, Alice's father mysteriously vanished leaving Alice a wistful version of the girl she one was. But it seems childhood nemesis Oliver knows where her father has gone and although Oliver is an insufferable bore, Alice believes once she finds her father, her world will become radiant once more. The tentative companionship between Alice and Oliver was incredibly charming. Oliver is conventional and often demure while Alice is loud, boisterous and fond of adventure. Together Alice and Oliver must navigate Furthermore, an enchanting world in which time shall not be wasted and visitors are appetising. Nevertheless, Alice is absolutely delighted by Furthermore despite Oliver's insistence to keep her oblivious to the dangers the two young travellers are facing. The world Tahereh Mafi has created is imaginative, whimsical and incredibly vivid. It was devastatingly spectacular. Furthermore also touches on feelings of abandonment, deception and a sense of belonging in a world in which you are labelled a pariah. Alice feels desolate, her lack of aesthetic colour leaves her detached from her community and will resonate with readers. Her loneliness is palpable. One of my favourite aspects of middle grade reads is the absence of romance. It allows authors to create wonderful friendships between characters, as is the case with Alice and Oliver. 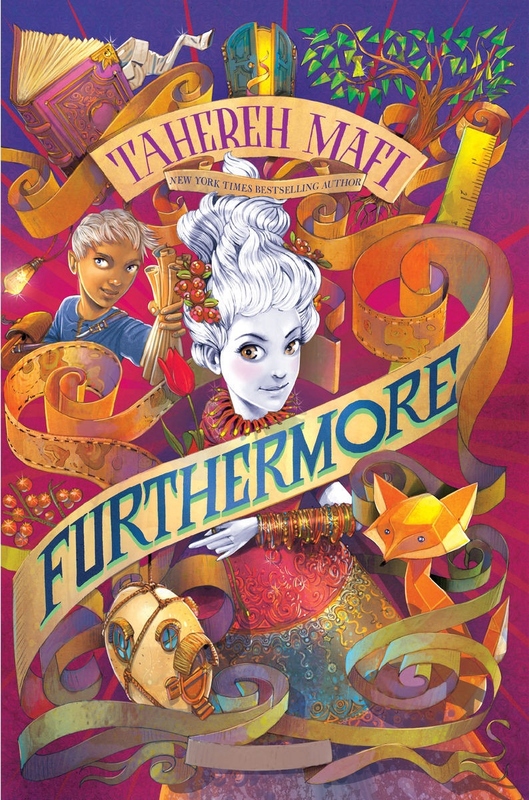 Futhermore is a beautiful exploration of middle grade fantasy, captivating and a fantastically fanciful narrative. 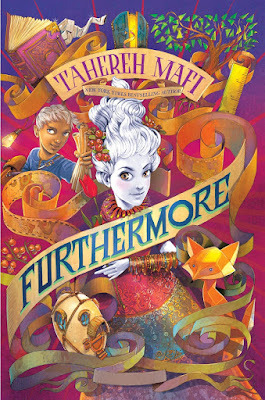 Tahereh Mafi is an exquisite author who crafts words delicately, lovingly, ethereally and Furthermore is immaculate. That cover is so stunning and I'm glad you enjoyed it! It was glorious Karen, a modern day Alice in Wonderland. So beautiful and incredibly joyful. Thanks so much for sharing. I'm glad to see you loved this one so much. It sounds really great, and I adore the cover. I just won an ARC of this one so I need to get started. Oh yes Lauren, it was so lovely and beautifully written. Atmospheric and lyrical. Tahereh Mafi is truly a modern day Lewis Carroll. It's not being marketed as a retelling, but it definitely takes cues from Wonderland and the wonder that is Alice. It's so lovely and lyrical and I can almost guarantee you'll fall in love. I'm thinking of buying the audiobook version as well. I absolutely adored Furthermore, it reminded me so much of the first time I had discovered Alice in Wonderland. That same childlike wonder. I think at this point, I'd read anything that Tahereh Mafi creates. Novels, post it notes, shopping lists. I've never been a fan of MG reads, so this book wasn't on my radar. But I'm glad you were able to appreciate Mafi's stint in the genre, Kel. Even though the characters are of middle grade age, it reads so much more as clean young adult, minus the romance really. It's absolutely beautiful Joy. Oh that colorful and clustered cover. I’m imagining in paperback some of that gold is shiny. I love the sound of this one! I’m on a self-imposed book buying ban at the moment (hahaha we’ll see how long that lasts) until I can get through some of my TBR. I’ll be saving this one to my wish list for a later splurge :-). Sadly there's no metallic on the cover, that would have been even more amazing! Perhaps the hardcover has though. I can't recommend it enough. As soon as that ban is over Sarah, I'd love to see what you think of it. I think it'll appeal to readers of classics, middle grade and young adult. It is on my TBR, too. Thanks Hana. I really hope you can pick up a copy of Furthermore, it's absolutely amazing! It's brilliant Haniya, a book that I can't recommend enough. I'm not a huge fan of Mafi's books, but I know Nereyda adored this one as well. I don't read a lot of MG, especially lately, but I'm always up for an engaging story as lovely as this one. I need to discover this vibrant world. It's one of those crossover type reads Nick, the characters are middle grade aged but it reads more as a clean young adult novel. So beautiful and lyrical, I just wanted to crawl into Furthermore and live there. gah seriously, where do you find these books? The last one wasn't published in the USA not that I found :( is this one published us? It's actually a US release Lily. It should be available in all bookstores over there. I purchased a copy as well as the ARC I originally read and had to purchase a UK edition, as it doesn't seem to have been published in Australia. But you should have no issues finding it over there. Would love to see what you think of it. YAY I'm so glad you absolutely loved it! I actually didn't end up liking Shatter Me, but this was phenomenal, and so very unique. And one of the reasons I love MG is because it doesn't have romance (which sometimes can get in the way of the actual plot). Thanks to you lovely girl. It was absolutely magnificent. I knew being Mafi I would have enjoyed it, but I fell in love with Furthermore. Even more so than her Shatter Me series. It's nice to read something adventurous and entertaining that doesn't have to rely on romance to further the storyline. Gosh, I want to read it again already. This sounds like such a beautiful, evocative read filled to the brim with colour and adventure! I'm looking forward to getting my hands on this one, beautiful review Kelly. It's truly amazing, it took my breath away! I plan on buying the hardcover edition as well shortly. I bought the paperback after reading the ARC edition and fell utterly in love. I know what a huge fan of Tahereh Mafi you are, so I am so happy to hear that you enjoyed this book! It sounds so vibrant and beautiful, and it seems like her writing really shines here. I have a copy sitting on my shelf and I can't wait to get to it! Oh no, don't wait you must read it now! It's too beautiful to leave on your shelf Aentee. I can't wait to see what you think of it.